We're off to Goa for the last wedding and plenty of beach time. All I can think about is eating and drinking all the coconuts in sight (I wish it were summer because it would be mango season). It's only fitting that today's post is a cocktail by the lovely Meg of Beard and Bonnett because this is one cocktail I'd love to drink by the sea. Meg is a super talented blogger and creates delicious gluten-free and vegan food on her site! She's also one of the friendliest and down-to-earth people you can meet and always willing to help. I'll let Meg take over now and talk about her lovely holiday cocktail. I am so excited to be visiting here on A Brown Table today sharing one of my favorite holiday cocktails! 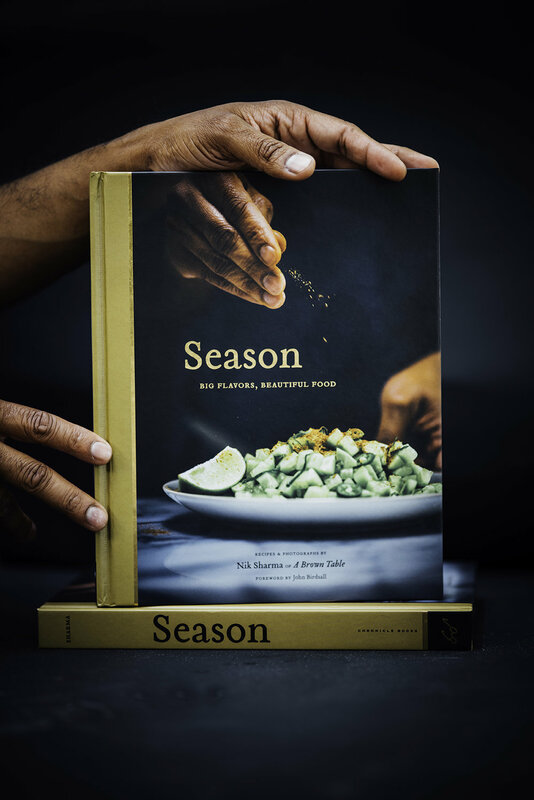 I have been a fan of Nik's inspiring photography and recipes for quite some time and am honored to have one of my own gracing the pages of his site. When I think about food during the Christmas holidays a few things come to mind - cookies, steaming mugs of hot chocolate, appetizers, and cocktails. Unlike Thanksgiving, where my family and friends sit down to huge decadent feasts, in December, we tend to host cocktail parties with tables loaded down with tapas and humongous homemade cookie platters. That's normal right? This cocktail has been in the works at my house for a few weeks now and I have to say it is one of my favorite cocktail creations to date. It is so easy to sip and the flavors of cranberry, vanilla, citrus, and ginger are a match made in heaven. If Santa were to whip you up a Christmas cocktail himself I imagine that this would totally be it! The recipe itself comes in 2 parts, one recipe for the cranberry vanilla syrup which can be made a few days in advance of your cocktail party and one recipe for the actual cocktail which you can double or triple as needed. I like to make a big pitcher of the cocktail minus the ice and let guests pour their drinks in their own glasses as needed. I intentionally made this drink easy for hosts by ensuring no special bar equipment is needed and the measurements are perfect to fill a wine glass so no need for washing extra glassware after the party is over. 1. Combine the cranberries, water, sugars, and vanilla beans in a heavy bottomed sauce pan. Bring the mixture to a boil over medium-high heat then reduce the heat to medium and simmer for 30 minutes, stirring occasionally until the liquid has reduced and the mixture has thickened. The cranberries will begin to burst as they cook and if the syrup thickens too quickly you can add more water a few tablespoons at a time as needed. 2. Place a fine mesh strainer over a large bowl and pour the cranberry vanilla mixture into the strainer. Gently press on the solids with a spatula to extract all of the syrup then discard the solids. Stir in the orange juice. Allow the syrup to cool then store in the refrigerator for up to a week. Fill a wine glass halfway with ice. Add the vodka and cranberry vanilla syrup then fill to the top with ginger beer and stir vigorously until the syrup is completely blended with the liquor and ginger beer. Squeeze a lime wedge into the glass, stir again and serve.